Historical Studies lays the foundation for all social inquiry and for informed debate on the politics and culture of our time. Bridging the humanities with the social sciences, our innovative program trains students in conceptual rigor, archival research, critical analysis, and historical writing. 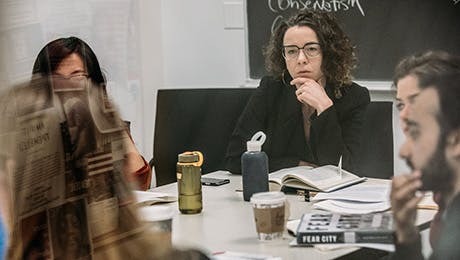 Our strong links to other New School for Social Research departments and to centers and programs located across The New School provide our students with unparalleled opportunities for engagement in critical social theory and interdisciplinary collaboration. Founded in the mid-1980s by Charles Tilly, Louise Tilly, Aristide Zolberg, and Ira Katznelson, the Committee for Historical Studies continues to build upon its original premise: history is a field of inquiry critical to all human understanding. We remain committed to developing theoretically-informed and critical approaches to historical questions. Our course offerings cover a wide range of historical periods and world regions, with particular strength in the large-scale transformations of the modern era. Areas of faculty expertise include the history of capitalism, history of politics, history of violence, gender history, history of psychoanalysis, history of social movements, and history and theory. Our diverse approaches employ the insights of critical social theory. Committed faculty mentors work with students to cultivate students' abilities as scholars, as educators, and as writers who can communicate to a wide audience. Outside of the halls of our department, students pursuing a degree in Historical Studies take part in the intellectual life of the NSSR's many centers, including the Janey Program in Latin American Studies, The Robert L. Heilbroner Center for Capitalism Studies, and the Zolberg Center on Migration and Mobility. Students contribute to our online publication, Public Seminar, and explore digital scholarship at the Digital Humanities Initiative. Beyond The New School, our students engage with New York City's peerless array of scholarly and cultural institutions. Our alumni pursue doctoral study at The New School for Social Research and other top Universities or put their training to use successfully in a wide range of non-academic careers. Historical Studies is available as the MA degree only. Students who complete the requirements for the MA in Historical Studies and wish to earn a PhD degree may apply for admission to the NSSR PhD in Politics or Sociology with a minor field in Historical Studies. Historical Studies explores what happened in the past, with the goal of interrupting our present and building a better future. Our courses focus on the major transformations of the modern era, which we explore through varied theoretical perspectives and analytic approaches. Our students work closely with faculty to develop their own research.